Fifteen games into last season, Indiana’s defense was spearheading a turnaround. The Hoosiers were 12-3 overall and 2-0 in the Big Ten. Both of those wins came on the road. Indiana was two games into a stretch in which it would go seven straight (and nine of 10) holding conference foes under a point per possession. As brilliant as the offense was, it was Indiana’s defense that could be relied upon (for the most part) when the shooting numbers dipped. This season, that hasn’t been the case. Entering the conference opener against Nebraska, the Hoosiers ranked 36th nationally in Ken Pomeroy’s adjusted defensive efficiency rating at .96 points per possession allowed. Three losses later, Indiana is all the way down to 75th nationally at .99 points per possession allowed. It’s been a complete free fall and only seems to be getting worse as the Hoosiers have had three of their four worst defensive games of the season in their current three-game skid. 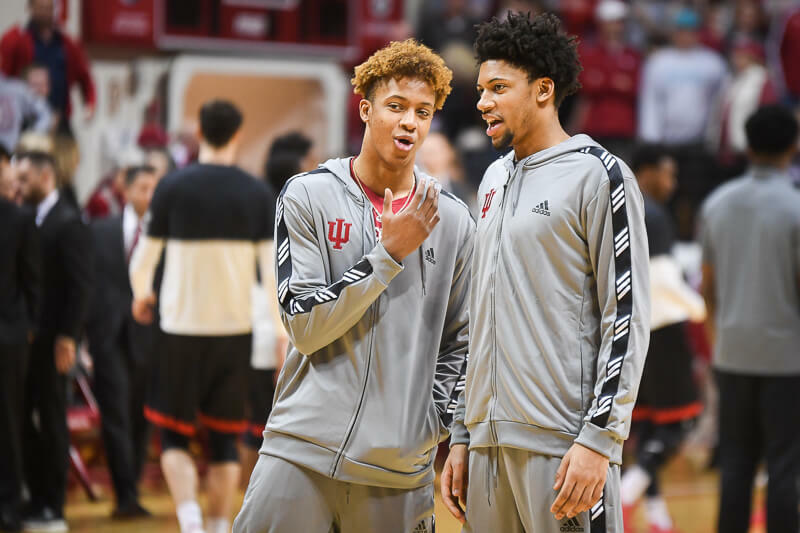 The Hoosiers are being exposed in a few keys areas, some of which obvious to the naked eye and some of which require a deeper dive into advanced statistics. Currently, Indiana sits at 41st nationally in 3-point field goal defense. There’s obviously a luck factor involved in defending the 3-point shot, but it’s probably not a coincidence that Indiana is getting burned from distance in its losses and against better competition. Overall, teams are shooting 30.7 percent from deep against the Hoosiers. In their five losses, opponents are shooting 40.4 percent. In terms of made 3s, Indiana is allowing 6.5 per game overall, but 8.8 per game in losses. During the three-game losing streak, opponents are shooting 47.3 percent on 3s against Indiana (27-of-57). Things haven’t been much better inside the arc. Indiana’s 2-point field goal percentage allowed for the season is 45.1. That ranks 74th nationally. In losses, that number is 51.3 percent. Indiana’s shot blocking has also taken a dip, albeit slightly, in losses. The Hoosiers are averaging 5.4 blocks per game, but just 4.4 in losses. Indiana’s season-to-date block percentage is 13.1, but just 11.4 percent in losses. Besides the aforementioned slides, Indiana’s inability to force turnovers has been a season long problem. But it’s a lot worse in losses. Overall, the Hoosiers are scoring 14.5 points off of turnovers. In losses, they’re scoring just eight. Indiana’s turnover percentage forced (16) is the worst of any Big Ten team and 318th nationally. So where, specifically, is Indiana getting burned defensively? In transition and guarding pick-and-roll ball handlers. According to Synergy Sports, Indiana’s transition defense is the second worst among all Big Ten teams. The Hoosiers are 251st nationally in transition defense, allowing 1.05 points on transition possessions. Only Illinois at 1.07 allowed is worse. The Hoosiers are better in pick-and-roll possessions, according to Synergy, but still have plenty of work to do. Indiana is seventh among Big Ten teams and 142th in the country in guarding ball handlers out of the pick-and-roll. And although it’s not a huge component of defense at the college level (only 7.1 percent of all defensive possessions the Hoosiers have played), IU is just 315th nationally in guarding isolation situations, according to Synergy. In 82 isolation possessions, Indiana has allowed 77 points. Of Big Ten teams, only Northwestern is worse. Indiana is also in the bottom half nationally in guarding off of screens and hand offs, according to Synergy. Add it all up and it becomes clear that, for all the complaints about Indiana’s offensive struggles and stagnation at times, the defense is a bigger source of the problem. 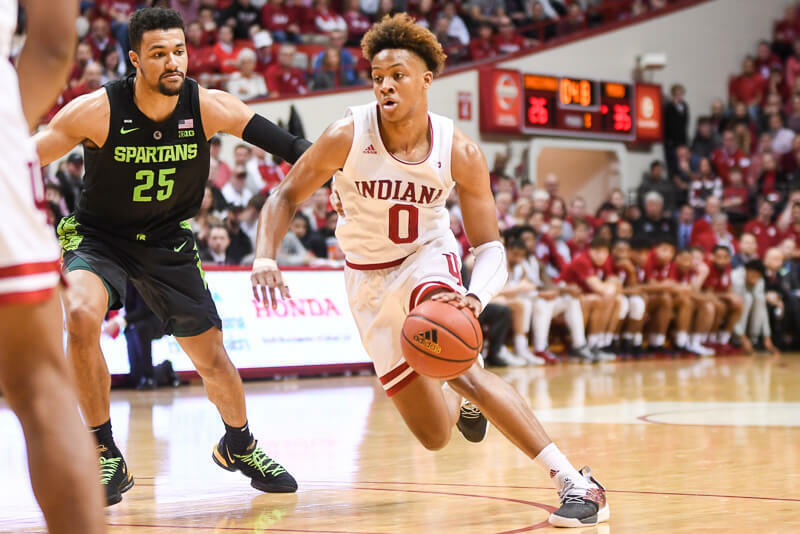 Indiana has dropped off offensively from a season ago, but that was somewhat expected given the personnel losses in Yogi Ferrell, Troy Williams, Max Bielfedlt and Nick Zeisloft. The expectation was that the Hoosiers, with a bigger frontline and more length, would be able to make up for it with a better defense. Fifteen games in, that hasn’t been the case. If we’re tossing names, I like Chris Mack from Xavier. His teams are always competitive, are generally in the top 10-15, and he recruits well (as we know, since they have stolen a few from us). I was surprised to see he is the 36th highest paid coach at about $1.2 million this year, Xavier’s highest paid coach ever. CTC makes more than 2.5x that amount. Completely agree with this analysis by Alex. Here is my thought, and I’m not saying it will correct all the flaws but a large issue with the defensive problems is the lineup. If Crean would simply stop playing this three guard lineup and play a bigger lineup that includes Juwan and OG playing the bulk of the minutes then a lot of the issues will resolve themselves. We cannot play Newkirk and JBJ together because that leaves two holes on the defensive end. Also, another major issue is that Crean is playing too many players which is known to do. You cannot play 10-12 players in close games, he must shorten his bench to the best eight players in key games. The best eight players right now are JBJ, Rob, OG, Juwan, De’Ron Davis, TB, CUJO and Newkirk. 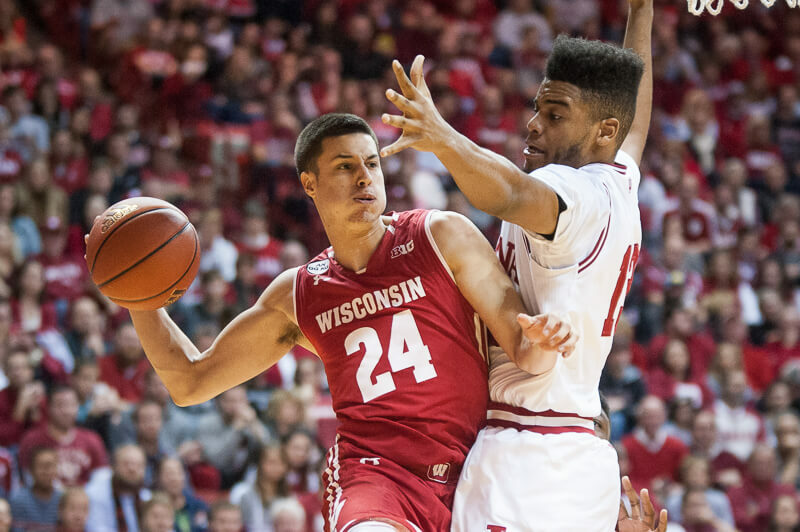 I applaud the defensive effort by Zach McRoberts against Wisconsin but he played far too many minutes in that game and offers zero offense. Just my thoughts and I’m not saying this will resolve all the issues but this would make the best of a bad situation and give IU the best chance to turn things around. Seems like we have this “new coach” discussion yearly. Crean great recruiter, mediocre coach. If everyone is comfortable with underachieving teams , getting bounced in sweet sixteen, a not coaching fault but kids fault ,and the worst offense/defense inbounding a basketball i’ve ever seen……..lets keep him. Spoke on Mike. I’m personally sick of the issues and discussion. Crean is a great person and I would never question his character but he has peaked at IU. It is time for IU to spend the money to be an elite program. Right now, we are not elite and to get to that level we have to be willing to spend the money to get the right person for the job. Coach K and Cal are making over $4 million more per year than Crean. Yes the deserve it much more than Crean, but for Indiana to land a top level coach they have to be willing to pay for it. I firmly believe if IU were to approach Brad Stevens and offer him $5 million per season plus bonuses that he would sign with IU and not think twice. That is not even wishful thinking, he’s only making $3.6 million with the Celtics. IU is capable if they are willing to pony up the cash. Good point. Everything is relative. If JBJ was just another guy at UK he’d be riding the pine for losing his man, hoisting bad shots, etc. As it is, IU needs his offense way too much to bench him. Made me think of the Grayson Allen situation too. If Allen were just some kid playing at a small school, actions like his (tripping, temper tantrums, etc.) might lead to long suspensions or even dismissal. Instead, he is an NBA prospect so one game suspension after all that drama. It is indeed all relative. I assume that you’re talking about the 2012 team? A team with tons of talent that ended the season getting blown out and not making it past the sweet sixteen because your coach didn’t have a game plan against the 2-3 zone. Yeah. Greatness. That’s fair; maybe amazing isn’t the right word, exactly. However, it’s currently the #14 offense in the country. And, as you know, it’s consistently a top 10 offense. NO offense is unstoppable. Teams have bad games or bad matchups. If you’re expecting perfection, you’re going to be disappointed. All that being said, I don’t think our offense maximizes our biggest strengths (front court), but it’s still a very good offense. Maybe not elite like it has been in several of the past years, but still very very good. Has there ever been a coach that willingly left the NBA for college? As usual, spot on, it was almost as if I was on my defensive therapist’s couch and he typed out a comment for me based on what I was telling him. lol As you say the sample size is not only big enough, but it also cements the obvious AND the painful, at least to me it sure does. Doesn’t take a mastermind to glean what it is showing. Everybody has things that they just aren’t that good at when it comes to their job and CTC’s is being able to get a team to play good defense, or dare I say, even average defense with some groups. I know he has a different philosophy when it comes to turn overs and what amount seems to be acceptable and I really wonder if he doesn’t have that same frame of mind when it comes to what is acceptable when it comes to defense. He seems to think that a really good offense will take care of any deficiencies that might appear, regardless of what it is. Trouble is, every team has off nights offensively and even more so it makes us a whole lot easier to game plan for. As far as the, cant or won’t thing goes, I lean towards it being both with the can’t part being a larger percentage of the equation than the won’t part. In my job when it comes to something that I know I could be better at, the time that I allot to those things is directly correlated with the degree to which I’m deficient and how much progress I have made working on those deficiencies in the past. I always spend more time on those parts than the ones that I excel at, but I just don’t believe Crean even spends the time in practices used by someone that can and does teach good defense uses, let alone the amount of time someone that knows that that is one of their weak spots should take. It’s kinda like I used to tell my players, you will play in games the way that you have practiced and what you have put effort and time into during practice will be obvious in games. No idea but if there is a first time for everything, especially if the money is there. I think CTC could slow the offense down a little, have players spend more of their energy on defense, go to a high/low offense which would utilize his bigs, and change system to assigned positions. They could still run given the transitional opportunity. Practice taking care of the ball and making free throws. CTC needs to rethink his idea of pushing the opponent to ‘fatigue’ because the only one fatigued is the IU players who are mentally fatigue trying to figure out what CTC wants. When OG was out, JM flourished. I see it very important for TC to get both more involved – with DD being the best pure post player. I like TB, but TC has not done TB any favors this year. If TB is now a 4, maybe coming off the bench is best. By now, TC should have a better handle on his player rotation: time is way past when he should be experimenting with lineups. Let RJ run the point and use JB as an SG only. I still love this team: deep and full of talent, it is incumbent on TC to promote a leader – maybe captain / co-captain position. These are young kids and they need our full support. Crean is not going anywhere until Glass does and i LOVE this team!! they are going to turn it around and the doom and gloom will be gone. we will all be cheering them on in the post season. i have full confidence that Coach Hartman will get em going! Mmm, its obviously a combo of things like money, job responsibilities, recruiting, legacy, style of play, location, etc. It’s pretty unlikely. The only thing that had me thinking he would make the jump a few years back was the fact that his family still lives in Zionsville, not Boston. Other than that, the signs seem to point to Mr. Stevens staying firmly in the NBA, if not Boston, some other team would take him. Nice. Did you notice where CH was in street clothes during the Wisconsin game? It bothers me that 2 games into BIG ten play people are already posting names for a potential coaching vacancy…We are 2 games into the BIG….Don’t throw the baby out with the bath water. This team still has talent. This is still the same team that beat UNC and Kansas and took an immensely talented Bulter team to the final possession in their home town. Am I ticked that we lost to Nebraska, IPFW, Louisville, and Wisky? Yes. No doubt about it. But as of right now Crean is still the reigning BIG 10 coach of the year. At least wait until after the tournament to start lighting your torches…. …If this season is a total flop and we are an NIT team…with sub 100 recruits coming in. Then and only then will I entertain your Greg Marshall, Brad Stevens, Steve Alford banter. I mentioned CH coaching the rest of the season on another thread somewhat in jest, but also cuz we need a different philosophy and I got no response except crickets chirping. !!!!!!! So he was in street clothes and obviously out for the season. He will add to the coaching aspect and I must of missed your previous thread. Has there been an official statement on CH? My thought on it is if IU were willing to make him a great offer then he would be willing to come to IU. He’s only making $3.6 million in Boston so if IU offered him $5 million plus incentives then it would be very hard for him to turn down the offer. Early in pre conference some media members were predicting him back mid bigten and the latest on BTN Crispin said out for the year. CTC has always maintained indefinitely and he’s progressing nicely followed by his value as a leader from the bench. I really have never heard anyone in the know say he is officially out. My opinion was that even if it were just at the end and post season and we were in position for a high seed, he should play and forego the redshirt. Now that we are struggling I don’t know what he should do. Come back for a few games of this trainwreck or come back healthy next year to a possibly even bigger trainwreck. If I was him I’d come back this year and maybe sign on as an assistant or manager next year. Sorry to say with his history maybe he should get into coaching instead of playing in Europe risking further injury. I think he has the makings of a good coach. I wish him luck either way. Kid has been thru a lot. 1. I attended Bob Knight’s basketball camp when I was 12. At one point we were introduced to Wayne Radford, and one of the kids in my group asked him how many points he had averaged the year before. Knight reacted immediately and angrily, essentially saying to the kid “Who cares how many points he scored? Why didn’t you ask him how many points he held his man to?” Even at a moment like that, defense was just soaked into his thoughts. 2. I have attended multiple open practices and scrimmages under CTC, and watched the practice televised by ESPN earlier this year. I don’t believe I have ever seen a defensive drill in any of them. To the best of my recollection, it has been all offense and scrimmaging. Not entirely a fair point to make, because a) it’s small sample size, and b) these events are staged in part for the benefit of the viewing public. But given the comments from Fran Fraschilla that CTC works on offense more than any other coach he has seen, and given the consistent disparity between our offensive and defensive rankings for many years now, it seems that what I have seen is not unusual. Defense just isn’t his thing, and we see the results on the court. I completely agree with you. What I’m saying is that Crean definitely had a great team in ’12 (as you state). I’m saying that how does such a complete team with TWO 1st round draft picks get blown out and resemble a high school team in the Sweet 16? Obviously it’s not the team, but the coaching (or lack thereof ). He just signed a contract extension without disclosed details. So, assuming they only added 2 years to his former contract and assuming he didn’t get a pay raise, that’d keep him there through 2021 at minimum. At $3.6MM * 5 years, that’s $18.3MM IU would need to buy him out. Then pay him $5MM a year for 5 years to start. 1. Alford failed at Iowa and did little at New Mexico. He has been so bad at UCLA that he essentially gave back a year on his contract. He is recruiting really well right now, but his teams don’t play defense, and even with all that talent is unlikely to win anything big. He’s playing Calipari’s game, but Cal is better at it and has STILL only managed one championship. 2. Brad Stevens and Billy Donovan are gainfully employed in the NBA and won’t return to college unless forced to by circumstance. 3. David Blatt has never coached college and never had to recruit. 4. Scott Drew not only has no character, he has done less with more talent than almost any coach in the country. 5. Mark Few already turned us down. He’s happy at Gonzaga. One thing I would point out: Brad Stevens and Billy Donovan were largely unknown “boy wonders” when they were hired. So was Bob Knight. So to some extent was Chris Collins, although he of course hasn’t yet had the success those other guys have. The point: I hope that our next coach is someone young and on the move rather than someone established like the coaches you’ve named. We’ve gone after established coaches two times in a row now, and in both cases got pretty much the same results as they had gotten at their previous stops. Sampson was reasonably good coach with lousy character, and Tom Crean had one hot team followed by a long run of mediocrity. Time for someone new. Or simply, they could seek an established coach with a better track record. As you pointed out, the last two had some red flags before they were hired and then brought the same results to IU. Pretty hard to get that kind of guy! IU is not the destination it once was (although it is in much better shape now than when CTC took it over…). Bill Self, Rick Pitino, Jim Calhoun, and John Calipari had time at mid-major or higher schools, so there is precedent for what you are talking about. On the other hand, John Wooden, Denny Crum, Dean Smith, Billy Donovan, Tom Izzo, Mike K, Bob Knight, and Roy Williams all had either no head coaching experience, or just brief stays at minor schools before getting jobs that led to national championships. Between them they represent roughly 1/3 of all national titles ever won, so that is pretty compelling. It’s all academic, of course. CTC is going nowhere. If he flops the rest of this year and next, perhaps a change will be made. But I’d say that at least until the summer of 2018 — and probably longer than that — he is our coach. I would say it’s accurate that it’s the general consensus of most folks who post online (ITH or otherwise). Personally, I don’t think this season is a bust unless you were planning on hanging banners. I think the team has the potential to get back on track and have a decent year, but the ceiling definitely feels lower. As for the rest, I agree with the consensus. I’ve been underwhelmed by CTC for years. Last season he started showing signs of improvements in many areas (sub patterns, in game adjustments, etc.) and I thought he had turned a corner. But unfortunately, that seems short-lived and he’s back to his stubborn self. Other than a 2-3 zone against IPFW and maybe pounding the post against Wisconsin, I’m not sure that I’ve seen any significant in-game adjustments. I think CTC is a better than average coach that will keep IU being a better than average team (credit: ForeverIU). Great points, Arch. The only thing that may make Indiana a compelling job for some more than others is the level of salary. 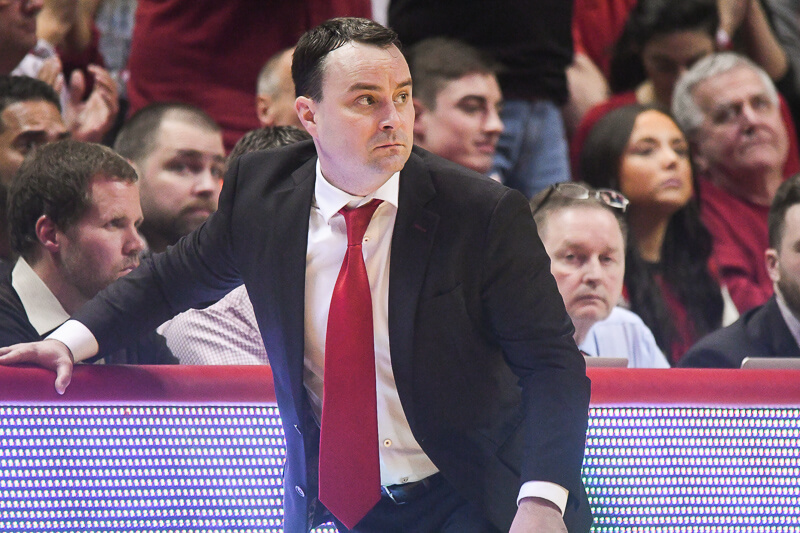 If you take a guy like Archie Miller at Dayton (who may or may not be worth looking at, but just an example here), he’s making about $700k per year. I would think that if you offered him CTC’s salary, it might be enough to tempt him. I personally really like my job, but if another company offered to quadruple my salary for doing essentially the same job elsewhere, it would be mighty hard to turn down. So while “It’s Indiana” may not mean as much as it used to, it’s certainly not an awful destination and the pay could be right for someone. I would think there would be some real options if and when that time comes to find a replacement. A mediocre recruiter and mediocre coach. Because if we keep Crean, then this will be the same cycle every single year. Why continue to do that? How is Steve Alford possible? He is the coach of the UCLA Bruins. They are a top 4 team? Has the number 1 recruiting class coming in. I would assume he is off the hot seat in S. California. Yeah their community has roughed him up out there. Kinda funny how the have Billboards say Fire Alford, and done other pranks to demonstrate their desire to throw him under the bus…. Hell he has done a great job this year. He was fouled by the UCLA fan base… Now he at the free throw line. 1 2 3 Swoosh! As much as I once liked the idea as Alford returning to IU, that is highly unlikely. IU once passed him up for the job. That boat has sailed. Brad Stevens? Now that would be a fun thought? But is he on the hot seat in Boston? Yes Coach Creans decline in the ability to recruit, mixed with Crean not producing on an elite level will most likely lead to his demise. But will we miss out on Stevens? That would take Crean being released in the same time frame as Boston releasing Stevens. That failed to happen with Sampson, kinda how IU missed the boat on Alford…. Well let’s just see what happens…. I still support Crean. But hey let’s face it. Would we pass on getting Brad Stevens? Hey I am going to stick my neck out here. With Blackmon and Bryant on the bench late in the 1st half, didn’t the Hoosiers make a defensive push? McRoberts was on the floor, and getting it done? Alex? Can ya help me out here? Look at the Wisky film, count his minutes? He couldn’t score, but by almeans he did the little things right. IMHO, IU should use the Illinois game. Start McRoberts at Point…. For as long as it takes, let Robert Johnson, James Blackmon, and Josh Newkirk fight each other for minutes… When McRoberts needs a break, Curtis Jones can get an opportunity to gain experience… Those three formentioned guards think they are NBA ready. They need to realize the truth. They have nothing. But an NCAA title is possible. That sleeping giant, Bryant. That dude needs a game tape and chat from Quinn Buckner…. When you are initially rated as the number two NBA prospect at center. You don’t call for the ball… YOU DEMAND IT! Especially when you earn the Rock last season…. Crean has told them all year, ball must come through him…. So what is stopping Bryant from demanding more from his teammates? He is the best shot IU has at having a floor General. Curtis Jones and Zack McRoberts have no choice but to follow coaches instructions… They might not be as seasoned or Athletic as Blackmon, but they do show effort…. Ya know, Bob Knight may be guilty of being abusive. But by no means did his players leave IU not knowing how to play Defence! Not trying to argue, but I think, unless things really change, we will see that #14 ranking slowly decline as the season continues. That ranking is arrived at by having all of those cupcakes that we played preconference factored in and as we continue to play much stiffer competition that number will continue to adjust, and unfortunately in a downward trend I’m afraid.